“We Never Have Any Fun” is a phrase often linked with OMBAC (Old Mission Beach Athletic Club). However, if you have ever attended the Over the Line tournament, you would know different. 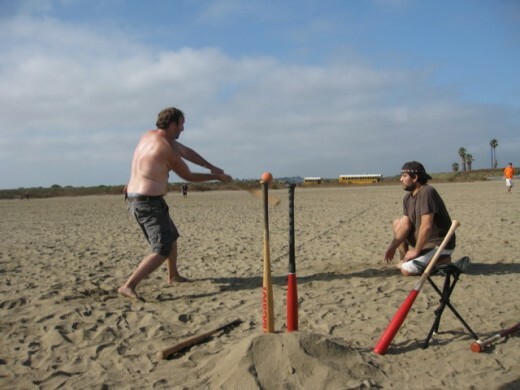 The annual Over the Line tournament, held every year on San Diego’s Fiesta Island in Mission Bay, takes place over two weekends following the 4th of July holiday. Unlike other sporting events that take place across the nation, Over the Line (OTL) is a strictly San Diego creation. 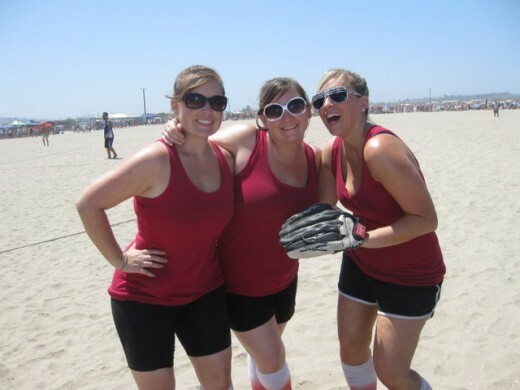 Compared to other team related sports, OTL radiates the beach atmosphere and attitude by only requiring two three-person teams and a small playing field. It’s the perfect game for a lazy Saturday afternoon on the beach with friends. Based on the game of baseball, the goal is to hit the ball “over the line” to score a hit. The game is quick, only three or four innings long. I had the opportunity to play on a team this year during the first Saturday of the tournament on July 9th. To be eliminated a team must lose two games. Needless to say, my team lost both of our assigned games but that did not stop us from enjoying the rest of the tournament. Unlike any other sporting event that I have participated in, OTL is one of comradely and good sportsmanship. There is an element of good will and fun that permeates the whole weekend. This may be due to less than serious team names that are encouraged if not required. My team name was “Charlie Sheen’s Sister Wives.” Other names are less than appropriate for this blog. The team names are by far one of the most entertaining aspects of OTL. Every year my friends and I listen and write down the best of the team names to reminisce about later. They range from clever to hilariously inappropriate. Amazingly, the announcer says every name over the loud-speaker without laughing or skipping a beat. Swinging for the Fences...or just the line! If you have never experienced OTL, it is a San Diego must. This San Diego institution has taken place since 1953 and has grown every year. Even the beach booze ban was not able to stop it. OTL is one of the few events in San Diego where drinking is allowed on the beach. Unlike other events where alcohol and crowds are often a bad combination, OMBAC maintains a low tolerance for violence. They work closely with the San Diego Police Department to ensure nothing gets out of hand. In the four years that I have attended OTL, I have never seen any violent behavior. 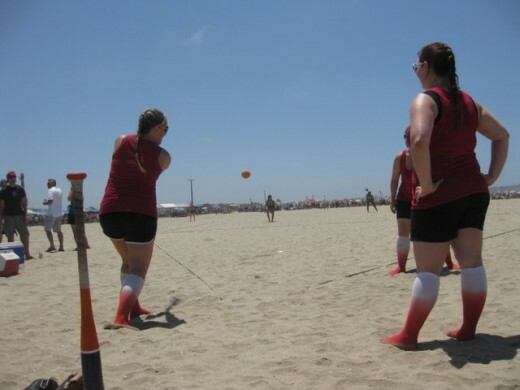 The true attitude of San Diego beach communities is represented in the OTL tournament – fun, sun and beer. The finals of the OTL tournament are taking place this weekend, July 16th and 17th. I encourage anyone who has never experienced it before to come check it out. You will not regret it. Remember, observe the five B’s rule: No Babies, No Bottles, No Bowsers, No Bikes, No Boas. Enjoy! Heidi Trent Burnett is a San Diego native and just completed a Master of Arts in History from the University of San Diego. Her master’s thesis is titled “San Diego’s Wilderness: The Changing Landscape of Cleveland National Forest.” Currently, Heidi is working for Bridgepoint Education when she is not practicing for next year’s OTL Tournament.